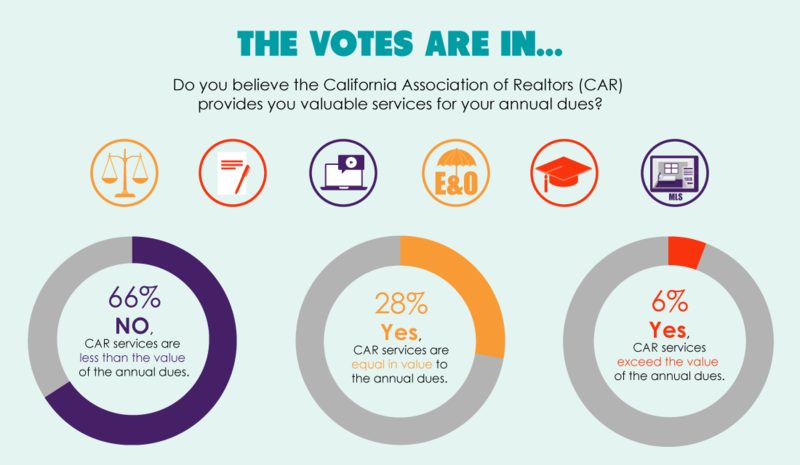 Here at first tuesday we regularly poll our readers who may be members of the California Association of Realtors® (CAR) to find out whether they believe CAR services to be worth the expense of their annual dues. While this trend remains unbucked, a growing number of readers have signaled they are, in fact, happy with the perks CAR offers its members — 28% of respondents find CAR services equal in value to the annual dues, up 8% from 2018, and far above 2017’s 10% of readers. So what does CAR actually offer its members, and is it actually worth it? Short answer: Not a whole lot that its members can’t get elsewhere. Sure, it’s easy to see the appeal. CAR provides 45-hour renewal packages, forms through its zipForm® software, MLS access and real-estate-related webinars — among other amenities such as legal advice and industry connections — all included in the cost of membership. But all this is disingenuous at best. CAR couches these services as being “free,” but considering the exorbitant member dues (which run up to $700 annually, depending on the local association), it’s hard to argue they are worth the price. For starters, the continuing education courses CAR offers are generic at best, and downright sloppy at worst. In addition, real estate agents can find inexpensive, easy-to-navigate 45-hour courses in a multitude of places — including first tuesday. As for forms, agents needn’t pay for them at all. 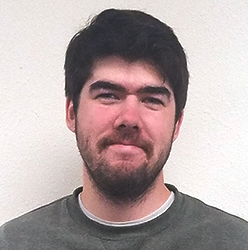 RPI forms are comprehensive, simple, and free to use. MLS access, the other big CAR membership myth, is available to any agent or broker who elects not to become a CAR member. While the belief that association membership is necessary for MLS access is not as prevalent as it once was, the misconception — which CAR has gone to no lengths to dispel — remains persistent and troubling. The crux of the situation is this: while CAR does provide some unique perks — though not for “free,” as the association claims — the bulk of its services are available elsewhere, often truly for free or at a much lower price. Therefore, we at first tuesday believe — and the majority of our readers agree — the price of admission is not worth the show. Member of CAR here and YES they are a complete ripoff and a monopoly whom I have no choice to be a member since my Broker is signed with CAR. My emails don’t stop with the continuous soliciting from CAR’S various workshops, classes and snake oils etc…they are relentless with the marketing and charge a king’s ransom for these workshops. I’ve been in Real Estate over 30 years and the greed that continues with CAR is incredible and like everything else in this world it’s only going to get worse. I’m not a fan of CAR. As an existing CAR member, it is my understanding that I cannot be a member of CAR without also being a member of a local association of realtors. After paying for the local association, CAR, and NAR the total cost to me was indeed over $700. In addition I was asked to voluntarily pay more as a donation to certian causes. It is true that most agents out there use the CAR forms. When I breifly worked for a broker who was not a CAR member, he introduced me to First Tuesday. I actually had an agent respond to an offer I submitted on the First Tuesday forms asking that I resubmit it on the CAR forms because it was her Broker’s policy. In the end I asked her to put it on a CAR form as a counter offer. The forms are the only benefit I use on a regular basis as a realtor member. Therefore I do think that the annual fee to join is excessive and would prefer to have an ala carte option where I waive all the other benefits and have access to the forms only. However, without the forms monopoly, their membership would decline drastically in my opinion. This is the second “article” that I’ve read by First Tuesday in the last year that has really rubbed me the wrong way. This is clearly a biased opinion that provides misinformation and promotes First Tuesday’s own products (renewal packages and forms) with complete disregard for the well being of their customers. While that sounds pretty over the top, the legal aspect (forms) is not to be underestimated in this business. I know this will fall on deaf ears because it’s only published on First Tuesday’s site, but this advertorial was emailed to me disguised as an article in a newsletter, which means it was also sent out to countless other agents (including some of my own). Our business is less than a drop in the bucket for First Tuesday, but I will not be referring anyone to this company anymore. To be clear, I’m not here to defend CAR in any way; I am just a dues-paying member like any other member. I have no affiliation with them other than that. First of all, CAR’s dues are not anywhere near $700. CAR dues were $184 this year. A Realtor’s TOTAL annual dues, which for most of us are still less than $700, also include NAR dues and your local association dues. To single out CAR and grossly misstate their dues to promote your own interests to countless unknowing agents is, for lack of a better term, not very sportsmanlike. Secondly, I, along with several of my agents, have actually used CAR’s free renewal package. It is indeed free and we were all very happy with it. I have also used First Tuesday renewal in the past and been happy with it. The main difference being that CAR’s product is provided at no cost after you pay your dues, while First Tuesday’s costs money regardless. Describing a competitor’s product as “generic at best, and downright sloppy at worst” is yet again, just not very sportsmanlike. You don’t have to like a competitor, but where I come from, bad mouthing a competitor is, yet again, not very sportsmanlike. And lastly: forms. I have been a full time Realtor for over 12 years and I have never once had another licensed agent, Realtor or not, send me anything but a CAR form. I would never accept anything but a CAR form in a transaction. This is not simply because their forms are superior, as I have no clue and don’t care if they are or are not. The fact of the matter is that the attorneys at CAR Legal (CAR’s free legal advice hotline, which I’d gladly pay much more than $184 in dues to have access to) have intimate knowledge of the forms and are able to give you guidance at any time. This is priceless. Try having an attorney review or give you guidance on any other proprietary contract to the tune of $300-600/hour of their time. $184 is a STEAL compared to that. And as someone else already mentioned, good luck getting your E&O insurance to cover you (or give you an affordable policy) when not using CAR forms. While CAR actually provides much more value than some agents/brokers believe, I truly believe most of those agents/brokers don’t know the wealth of information and assistance they actually have at their fingertips because they haven’t needed it yet or simply don’t know. I hate paying my dues at the beginning of the year as much as anyone else, trust me on that, but if you’re an agent/broker that truly cares about your profession and clients, you’d be doing yourself a great disservice to try to save a few bucks up front on these dues. This paragraph is strictly my opinion and that should be clear, unlike the biased advertorial published above. Please tell me where you pay less than $500/yr. for CAR, my dues are more than $700/yr, PLUS my MLS and NAR. The forms alone are $1,000/yr. Having a monopoly on the “standardized” forms is truly the only reason one would join CAR. I have been licensed since 1986 and thought that being part of one of the biggest lobbying group in the nation would give us some clout, regrettably, 2008 and the laws created in the after math have proved me wrong. The competition from other online marketing groups, the bogus “surety bond” real estate agents have to acquire to be able to help someone or even consult with someone in foreclosure does a disservice to the public. Has anybody tried to get one of these bonds? They don’t exist. So who’s there to help the public, the homeowner, the people who we make our living representing? And the legal “Hot line”? When I tried to use it over the past 33 years, they have repeatedly found ways to sidestep any legal help. Again, if I can get the service for $184 – count me in! But when I am paying the better part of a thousand dollars each year to be poorly defended against Wall Street greed,corruption and control of our industry and forms – no, it’s not worth it. This is only my opinion and I would Love to be wrong about – but this is how I see it from the trenches. Please look at your invoice/billing. If you are a member of CAR, your dues were $184 last year. Doesn’t matter what city you’re in, those were the dues every CAR member paid. Your total dues (which typically include NAR, CAR, your local board, and maybe others) might be $700+, but your CAR dues are a small piece of that puzzle. It sounds like a lot of people that are complaining about “CAR dues” do not understand what they are paying, which brings me back to my point of not knowing what you truly have available at your fingertips at any given moment. I’m not sure what area you’re in, but all of my dues combined this year were under $500. If you’re paying $700, it’s not CAR’s fault. I’m not sure why you’re paying $1,000 for forms either….those are included as part of my $184 CAR membership. I’m sorry to hear you haven’t had good luck with their Legal Hotline, I’ve used it plenty of times with no real complaints. Joh H, where in the heck do you pay $184 in dues, Kansas?..I love first Tuesday and love rogue’s against a unfair system of paying for CAR and their liberal agenda, I pay close to $700 and forced last year to pay additional for lobbyists which I am opposed to paying for steak dinners and party girls, I get nothing from CAR but tons of unwanted email and articles that don’t really help with anything..It is just another political illusion. THANK YOU FIRST TUESDAY! “liberal agenda”??? Where the heck are you, Barbara, the State of Jefferson? Presumably, everyone on this site is in California. My C.A.R/NAR 2019 dues were $185; happy to send you a copy of the invoice (admittedly, I don’t pay County association dues because I’m “over the hill”). Lol…I hate to break it to you, but there is only one place in the country that one would pay CAR dues….the state of California. My combined total dues (NAR, CAR, and local board) were under $500 this year. Please look at your billing to see where your $700 is actually going; only a small part of that ($184) is going to CAR. The additional, one-time $100 increase we were forced to pay last year to CAR last year that you are complaining about served a VERY specific purpose, which was to put a prop on the state ballot that would have GREATLY expanded and improved Prop 60/90 benefits for senior homeowners looking to move. I was more than glad to spare a measly $100 to try to SIGNIFICANTLY help senior homeowners move to a new home without getting slapped with a tax bill that would be thousands upon thousands more than they’re used to paying (which for many of them is THE roadblock to being able to move). I’m not going to go on a rant about how significant of a prop that was because it unfortunately didn’t get enough awareness/traction to go through, but please don’t complain about having to spend $100 on something that you probably didn’t even bother to care who/what it benefited. It was for something that would have greatly benefited some of your clients, your friends, your family, and evenly quite possibly yourself. We were “forced to pay” that by members just like you and I that voted it into place, by the way. You are welcome to vote for these things just like I am, imagine that :) Lastly, my local association even split that bill with its members; they paid half of everyone’s bill, so we only had to pay $50 out of our own pocket. But you’re right, CAR is to blame for all of the world’s woes. And how’s that working out for us agents. All those companies are going full force right now, and will continue. So if CAR a must have for new agents??? No, it is not. MLS and CAR are separate entities. In my estimation after 40 years of being licensed, only the CAR forms are useful. First Tuesday forms are just as good, but are rejected by people who don’t know any better. When I first came into the business I was told that a contract written on a brown paper bag was legal. If you work for a broker, you have to follow suit. If the broker belongs to CAR and MLS, you must too. I have had agents try to reject my offers on FT forms. They cannot in good conscience reject ANY written offer as it would be a disservice to their client. It’s not for the agent to say. Ask the client if they care about what kind of forms are used if they want their house sold. Forms are only forms. Interesting take from a company that is in essentially in direct competition with C.A.R. when it comes to providing certain amenities, particularly with respect to education and “free” forms. As to “free”, the argument can easily be made that the C.A.R. perks are in addition to the cost of admission (dues) paid by each member. Interestingly, your survey is based on 127 votes but that is hardly what I would call a representative sample because your own article in November 2018 (https://journal.firsttuesday.us/the-rises-and-declines-of-real-estate-licensees/2983/) claims there are approximately 205,000 agents in California. C.A.R. claims they have approximately 185,000 members so that really seems to skew your poll results. I’d venture to guess that the vast majority of your readers fall into the approximately 20,000 California agents that are not C.A.R. members. With a population of approximately 205,000 agents, a representative sample would be much closer to 400, allowing for a 5% +/- margin of error and a 95% confidence rate. That’s more than double your survey respondents. I’ve been a member of C.A.R, NAR and my local association for a number of years and can state unequivocally that there is a huge value in belonging to an organization that advocates and influences legislation on behalf of the real estate industry, homeowners and ownership issues. In addition, C.A.R. provides free legal advice, only a phone call away, that would cost thousands of dollars each year if I were paying an attorney every time I wanted advice. Those two things alone are well worth the price of admission to me. Brokers might want to doublecheck with their E&O carriers as well to make sure that they have full coverage if they are using forms other than C.A.R. zipForms. Making informed decisions requires researching issues on both sides of a debate. Excellent analysis of a very self-serving and misleading article. So what is CAR going to do, if anything? The same applies to the local mls orginaxations such as socals, OCAR, snd others. It seems that it actually opens the door to companies such as Zillow, and others. Who is going to wake these people up to the 21st century? I recall a time when all the info was in a book published every two weeks and was propriety to the agents. Now seems like everyone has access.